Blondes, brunettes, redheads – your Insta feed is probably filled with women sporting these hair colors. But you know which natural hair color is sorely overlooked? Black. Gorgeous jet black hair that looks like a piece of the night sky itself has been transposed onto your head…wouldn’t that look magical? Now the only question that remains is how to get this stunning hair look. And the simple answer to that is black hair dyes! There are a ton of different brands that stock up on black hair dyes. All you need to know is which ones to actually go for. That’s where I come in! Here’s my rundown of the best black hair colors that you need to try out. When a shade goes by the name Ultimate Black, you best believe it’s going to give you the ultimate black hair. And that’s exactly what L’oreal Paris Superior Preference hair color does. 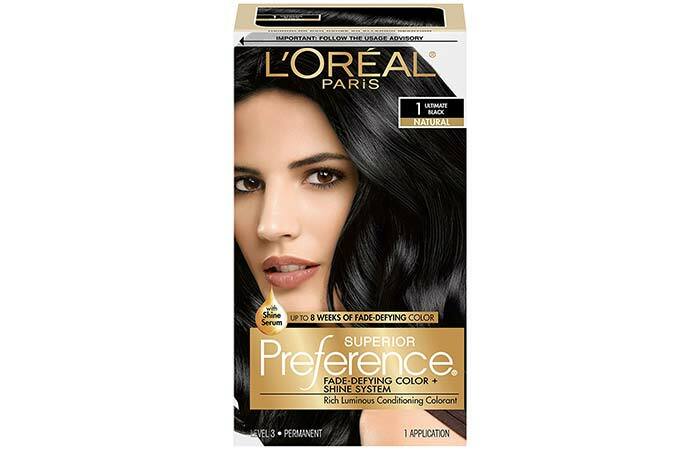 This Superior Preference range of L’oreal hair colors is known to provide super shiny and luminous results. And the Ultimate Black shade is bound to give you hair that is deeply black and not at all dull or lifeless. The Fade Defying system of this translucent hair gel formulation also ensures that your black shine lasts for at least up to 8 weeks. It also comes with a Care Supreme Conditioner with Shine Serum that makes your color look vibrant and your hair silky. Now, this one is for all you ladies who are on a mission to cover all their greys. 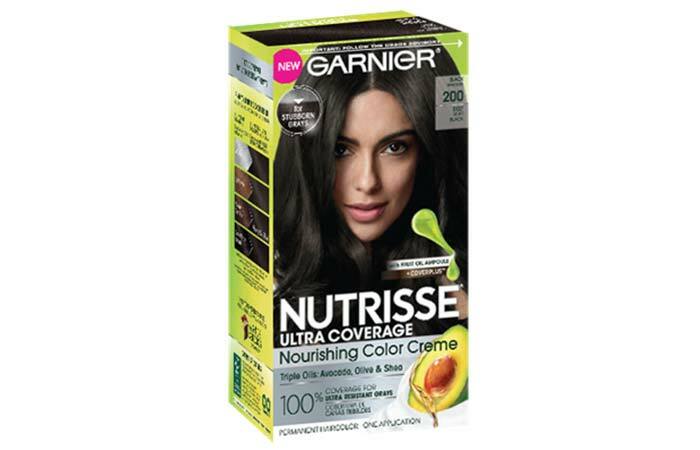 This creme based hair color offering by Garnier Nutrisse in the shade Black Sesame promises to give you the richest and most radiant black hair that is also silky and shiny. This at-home hair is also formulated with a CoverPlus Technology that aims to provide 100% grey coverage on even the most stubborn and resistant greys. This offering by Garnier also comes with an after-color conditioner infused with shea, olive, and avocado oils, which deeply moisturize your hair. Revlon does not mess around when it comes to its hair colors. When it says Black, it black. 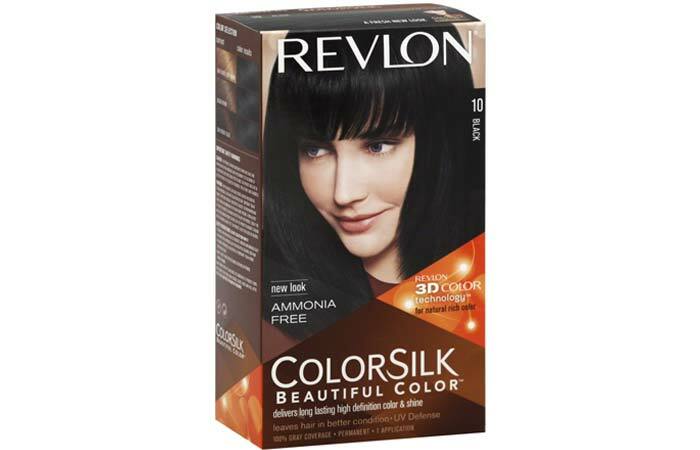 This ammonia-free hair color is formulated with Revlon 3D Gel Technology that is a combination of special blended dyes, conditioners, and polymers that you get the most natural looking color from root to tip. It also works to add dimension and shine to your hair color. This ColorSilk range of hair colors also contains UV Defense components that protect your hair color from UV damage and make it look ultra vibrant. Lastly, this gorgeous black hair color also contains silk proteins that nourish your hair. For those of you who wish to channel their badass only temporarily with black hair color, Manic Panic is the way to go. This cruelty-free product in the shade Raven lends your hair an intensely black color that lasts for about 8-12 washes. 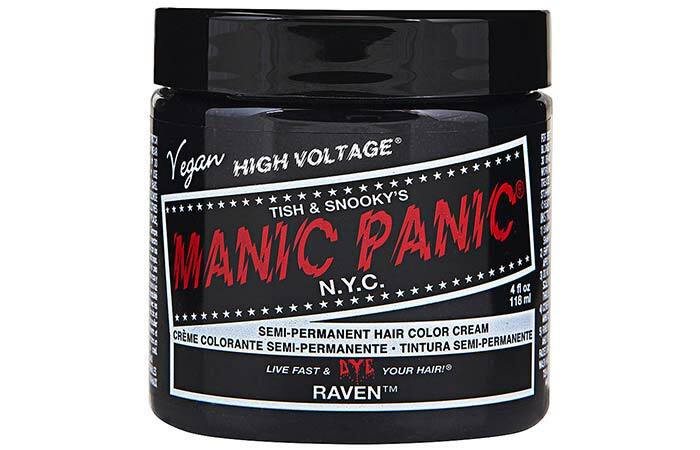 Interestingly, this Manic Panic color does not contain the allergen PPD which is found in most black hair dyes that are on the market. Besides being cruelty-free, this black hair color also does not contain any parabens and ammonia and is 100% gluten-free. This one is for all the black ladies out there who are looking for the most intense black hair that will work well with their hair texture. 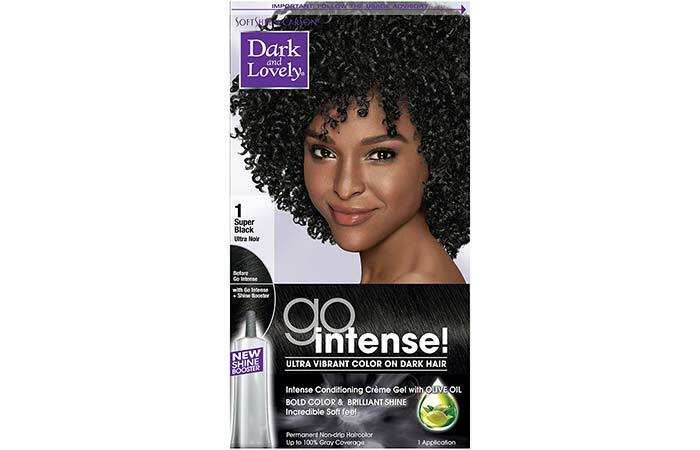 Dark And Lovely’s Go Intense hair color in the shade Super Black comes in an anti-drying creme gel formula that is infused with olive oil, which protects your hair from damage and breakage. It is also formulated keeping in mind the specific texture and natural color of African hair in mind. The boosters contained in its color formula also ensure that you end up with the most intensely black hair color. Don’t you hate it when you’re about to head out the door and notice grays in your hair when you do a last-minute mirror check? Well, instead of admitting defeat, you can actually grab a box of Just 5 Hair Color! 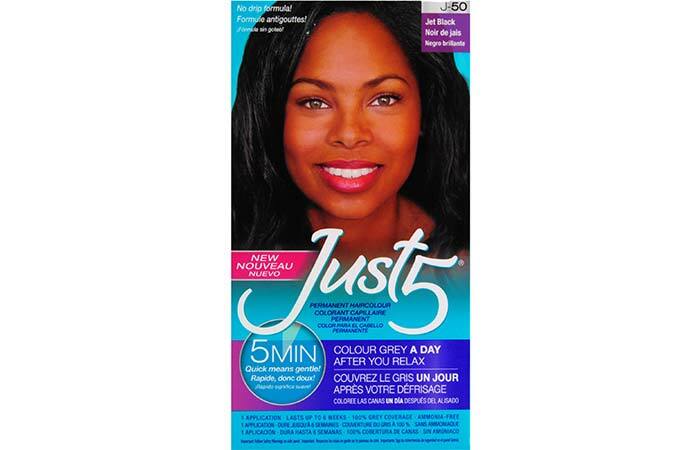 As the name suggests, Just 5’s Jet Black processes in just 5 minutes and effectively covers your grays. This ammonia-free solution is also so gentle that you can even use it just a day after you’ve relaxed or straightened your hair. Just 5 is also infused with MoistureDuo conditioners that nourish and protect your hair. 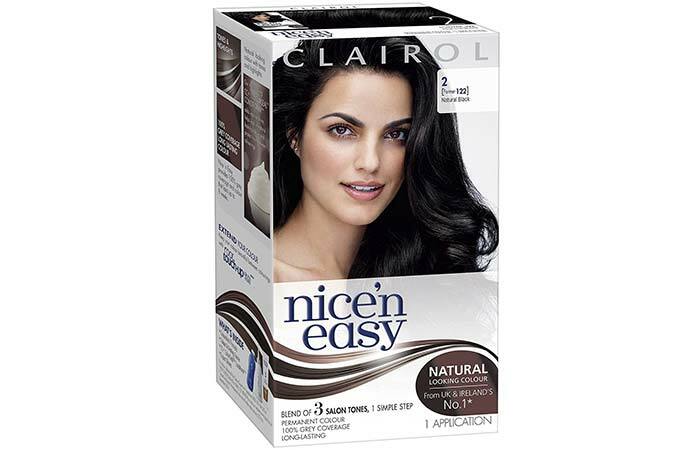 Treat your hair to the most natural looking of hair colors with Clairol’s Nice’n Easy hair color in the Natural Black shade. This Clairol hair color’s claim to fame is that it lends your hair such a natural and blended hair color that it looks totally natural even under revealing sunlight. It also offers 100% gray coverage and processes in 45 minutes. Lastly, it comes with a CC Color Seal Cream conditioner that makes your hair shiny and soft when you wash off the black hair dye. Just because you didn’t go to the salon to get your hair colored does not mean that you don’t want it to look like it was colored by a professional. 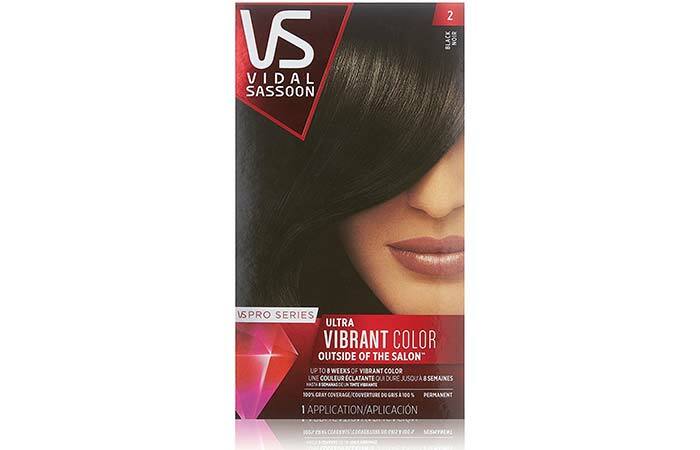 Vidal Sassoon promises to do just that with its Pro Series of hair colors. Its Black shade delivers a natural muted black color to your hair while making it look fashion forward. It lasts for about 8 weeks. Additionally, it comes with a water-resistant conditioner that prevents your hair color from fading out too fast and maintains its vibrancy. 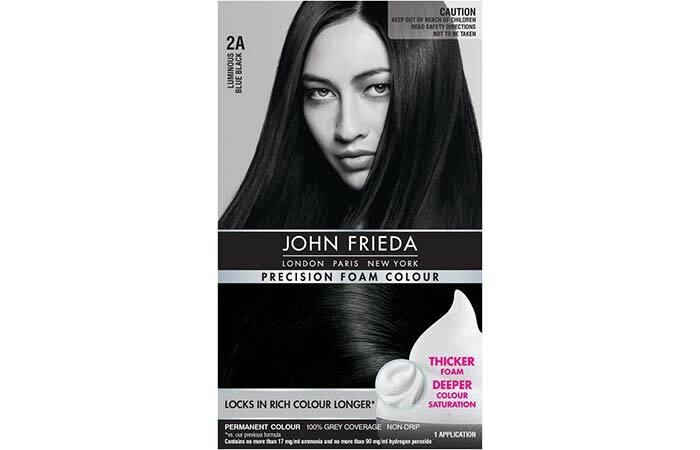 The hair care experts at John Frieda offer this thick precision foam color that promises to give you salon-quality hair. Its Luminous Blue Black shade, as the name suggests, is a luxurious black hue with deep blue undertones. It does not fade quickly. 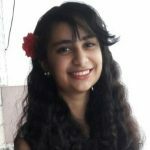 But the best feature of this black hair dye is that its foam formula ensures that it does not drip anywhere and saturates your hair easily from roots to tips. Plus, it comes with an after-color conditioner that seals in the color and enriches its tone. 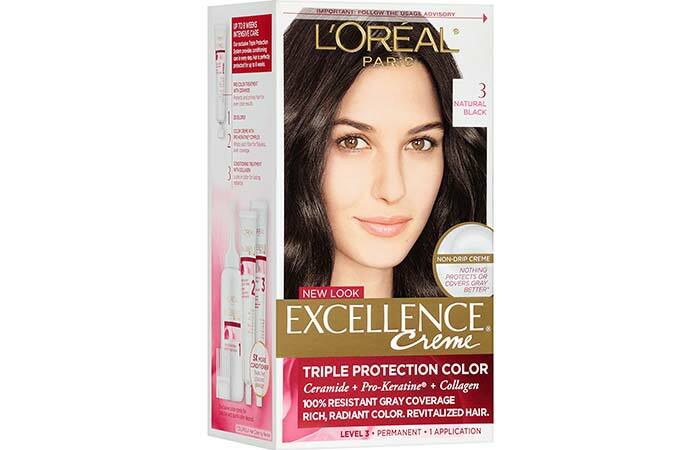 The tagline of L’Oreal Paris Excellence Creme hair color is “No hair color cares more, covers more.” And I would say that’s a pretty accurate claim that they have made. It triple protects your hair by sealing, replenishing, and conditioning it with ceramide, pro-keratine, and collagen while giving it a rich black shade. Another reason why it makes for an excellent hair color choice is that it contains 5 times the conditioner as other hair colors, thus making it super nourishing for your hair. This Natural Black shade comes in a creme formula that makes for drip-free application. So, go forth, my friends! Get yourself some hair as black as night (just like Snow White!) by picking up one of the gorgeous black hair colors! And don’t forget to comment below to let us know which one you chose!